Many people own animal that they would like to train to do tricks and or Agility, but they just do not know where to start. Here are some ideas of how you can get stared. Just remember, every trainer is different, every animal is different and every setting (training area) is different. So What works for one person with their animals may or may not work for another. Again I will remind you, because it is so very important, that you will need low to the ground, wide cut, stable Agility Equipment for your Guinea Pig. Guinea Pigs are ground dwellers. They are not like a rat that is very agile walking a tight rope, Guinea Pigs do not jump like a Gerbil. Guinea Pigs may not be a quick to run an Agility Course as a Dwarf Hamster, but with the right Equipment and Proper Training, you might be surprised at how well a Guinea Pig does on an Agility Course. Keep training fun and upbeat. YOU ALONE ARE RESPONSIBLE FOR THE CARE AND SAFETY AND PROPER TRAINING OF YOUR OWN ANIMALS. THESE ARE IDEAS AND SUGGESTIONS WE HAVE USED FOR OUR OWN ANIMALS. WE WILL NOT BE HELD RESPONSIBLE FOR THE TRAINING YOU DO OR HOW YOUR ANIMALS RESPOND. YOUR PETS DEPEND ON YOU FOR THEIR HEALTH AND SAFETY AS WELL AS DIET AND EXCERSIZE. DON'T LET THEM DOWN. Matey, our 5 month old boar Guinea Pig, learning the first few pieces of Agility Equipment. We think he is brilliant! and pretty cute too. Please watch til the end and see what a difference a day makes. There are many items right in your home that you could use to get started training your GP Agility. Just PLEASE make sure the items are safe and stable for the GP to maneuver. Some items will take a bit of work by you, some you many use as is. Each item you choose needs to be stable enough for the weight of the Guinea Pig. Jumps should not be too high. 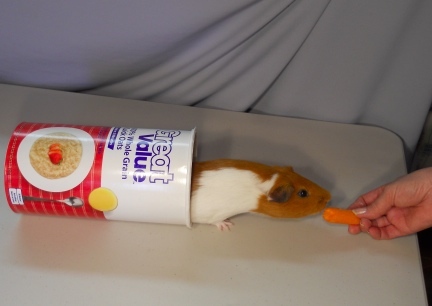 There are many items a person could use for a Cavy Open Tunnel. It does not need to be too long as long as it has a large enough diameter for the GPs body to get through easily. 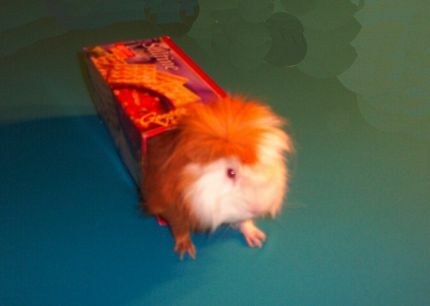 A saltine cracker box opened on both ends will work for smaller Guinea Pigs. I wish this were a better photo. You can see that GI P Guinea is coming through a cracker box. It is a bit small, but the truth is the photo was taken like one of those dog nose photos where it looks like the dog had this huge face and small body. This is Matey coming through an Oatmeal Box with the bottom cut out. Jumps are a little more tricky. You must have something that is not too high, that will support the Guinea Pig's weight as it climbs across it, and something that is not too wide. Most Guinea Pigs don't jump the jumps, they meander over them. What we call in agility "maneuvering" over the jump. Weave Polls are one of the easiest items to find around the house. If you have a child that plays with toy construction equipment they might have some little orange traffic cones. 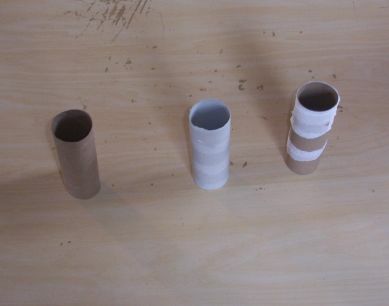 Use empty toilet paper, wrapping or paper towel rolls for your Weave Polls, just tape them down to the table so that they will not fall over. You could even decorate them. An embroidery hoop, the lawn game jar hoop, a clean hoop dog toy or such can be mounted to a frame or held in your hand. If you have a large hardback book or a scrap piece of lumber, set it on a wooden spoon for the pivot point. Don't make the pivot too high or the board item will slide as the GP walks across it. This could be something as simple as a large book. 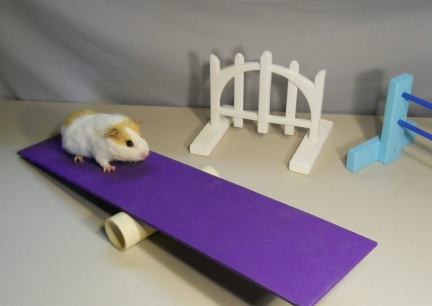 HOW HARD IS IT TO TRAIN GUINEA PIGS TO RUN AN AGILITY COURSE? Well? LOL That depends largely on the animal and the trainer. If you have trained dogs or cats or any type of animal you are "one up" on someone that has never trained before. If your GP is healthy and is bonded to the owner that will also make a huge difference when training Agility. Does your GP love treats, that also may help in your training. All in all, it is not too hard to teach a cavy to run an Agility course. If you are consistent and fair with the animal, it will come relativity easy. Think of it like this.....if someone came to you and spoke a foreign tongue and was trying to teach you something what would it take for you to understand? Work your pets with that same perspective. I have honestly seen humans talk louder to an animal thinking, I guess, that the animal would understand better if it were just a bit louder. LOL Now you understand what I am saying, ey? Guinea Pigs can and do learn words we teach them. Words, not paragraphs. Keep commands in words and use the same word consistently. Something I have noticed with the average person when they train a dog....when they tell the dog "down" it might mean, "get off me" and another time it might mean to "lay down" and another time it might mean to "get off the couch". Now, most dogs can understand, but it takes longer. For instance, if you use the same word "down' for all three commands here's what might happen....you come in and the dog is sitting on the couch. You say "down" and the dog lays down on the couch and you get mad at the dog......who is in the wrong here? LOL Keep the same word for the same action you want and use it each and every time. HOW DO I GET STARTED WITH MY GUINEA PIG/CAVY AND GUINEA PIG AGILITY? First and foremost, start with a healthy Cavy that is bonded to you. One that comes when it is called or at least follows your finger on a table. I HAVE MORE THEN ONE GUINEA PIG, CAN I START BOTH OF THEM TOGETHER? Yes, but let's clarify "together". Train each animal, one at a time, with the other in a holding cage set up where it can see the other being trained. You may actually have more success training like this then someone training only one GP off and by itself. HOW OLD DOES A GUINEA PIG HAVE TO BE TO PARTICIPATE IN GUINEA PIG AGILITY? My opinion is to start with a young Guinea Pig. Younger GPs are often more adventurous then older GPs. Younger pets are not yet "set in there ways" as an older one can be. That said, what is old? If you have a one year old guinea pig, that is like a 14 y/o person. 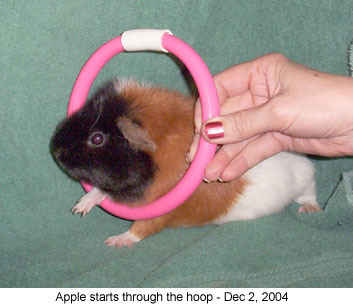 Many people make their own Guinea Pig Agility Equipment. You can see some of the measurements on our The Equipment page here at this site. You can also use "make shift" equipment with items around your home. See our Getting Started page/above for ideas. Just make sure what ever equipment you chose it is safe and stable for your pets. We are working here at "Guinea Pig Agility" to offer (in the near future) some Guinea Pig Agility Equipment Pieces. Please check back. I recommend you spend time with your pet a few minutes, at least twice, every day. You do not have to be training each time, just spending time with your Guinea Pig. I highly recommend that if you have an event coming that you spend at least 10 per day training or readying your Cavy for the event. An event can be competition, an organized training section with friends, a demonstration you are putting on for a local school, church or other organization.....or, even if you are just going to show off for your family and or friends. The more time you spend with your GP, the more time you and your GP will want to spend together. WHAT PIECE OF EQUIPMENT SHOULD I START MY GUINEA PIG ON? Keep working with the same piece until your Guinea Pig "gets it" and manipulates it correctly, getting on and getting off in the correct manner at the same end of the piece each time. After the GP has learned the first piece well add another piece behind this first one. Work the GP in a continuous matter. In other words have the GP do the first piece then do not reward until it does both pieces....piece one then piece two, then reward. After the GP has learned to run two pieces well and correct add a third piece and so on until you have your full course set up. It depends on what you are doing at the time. Is this a training event? Has the Guinea Pig learned to use each piece of the course? Is this a Competitive Event? In an event the amount and what pieces would be set by the event host. For novice classes usually five pieces are used. If more classes are offered, there may be more Agility Equipment Pieces in each class offered. It also depends on how many pieces of equipment are available for use. Do you own one piece of 20? GPs are smart and with good training and for a good treat many will run the course no matter how large it is. MY GUINEA PIG HAS LOST INTEREST IN TRAINING, WHAT DO I DO? Change your training technics. If you train on the same table the same course the same direction each time your train (and I recommend this to start) change the side of the table you stand on, change the course, mix up the pieces of equipment so that it is a new course for the GP to run. Bring new and tasty treats. Make a bigger fuss over your GP as it preforms. Just make it fun for the GP. Many times if you start a new GP, while the GP you were formally working daily watches, it will refresh the oldsert to want to "play" again. Many times too, it will help both GPs, watching one another to do better when running the course. (This is true with all animals including human children). Maybe not, but I bet if there are other GP owners they would be interested in learning more about Guinea Pig Agility. You might want to start a group. I did this in WI by just setting a date at a park and inviting friends that had rabbits and ratties to join me there for the fun. I took the Agility Equipment I had for each species and we all had a ball. We met twice a month and ate out, dutch treat, after the event. Some evenings we had as many as 14 people that participated. Some people, mostly in the UK and Sweden call the equipment pieces fences because all small animal (including dog and cat) agility ideas came from horses in Steeplechase. Steeplechase is an obstacle course with many types of fences for the horse to jump. Dog Agility came next and so people called the jumps fences for quite sometime. When it came to rodent agility many people continued calling the equipment fences, even the tunnels may be called fences. An Agility Course has equipment on it that the rat will maneuver over, under around and trough. A Maze is usually a "puzzle" set up out of cardboard or wood with high walls and dead end halls that the rat must get through for a treat at the end. Yes, that is true. Many small animals, gerbil/gerbils, hamster/hamsters, mouse/mice, pet fence rat/rats/ratties as well as rabbit/rabbits and or ferret/ferrets are also do agility. Each species has their own size equipment.Each species is a little bit different, but one thing is the same in training them, the tighter the bond, the more time spent training them, the better they will do at agility or trick training. PLEASE JOIN US ON A YAHOO GROUPS ELIST CALLED THE AGILE RAT. WE ARE A FRIENDLY GROUP AND WE LOVE TO HEAR ALL ABOUT SMALL PET TRAINING AND GENERAL SMALL PET STORIES. YOU CAN LEARN MORE ABOUT SMALL PET AGILITY TRAINING AND EVENTS, MEET OTHERS THAT ARE TRAINING AND ASK ANY SMALL PET QUESTION ABOUT CARE AND OR TRAINING OR ANY THING ELSE YOU MIGHT WANT TO KNOW. The contents of this page for Agility-Getting Started-FAQ is still under construction. Please check back later!